This paper presents Word by Word—a mobile game that allows visitors to personalize and share their experience by allowing them to construct and continue each other's stories based on the objects that they observe within the museum. The objective of the game’s concept and development is to contribute to the ongoing body of work in how mobile games could be used to support meaningful social experiences within museums. Through the use of humor, the game encourages visitors to socialize within the museum and provide unique personal interpretations of the artworks. Through a process of iterative design, our research provides insights into which mobile interface design factors could inhibit or enhance a collaborative storytelling experience, and how a mobile game could be used to support a meaningful social museum experience by encouraging visitors to construct their own personal interpretations of the artworks. Word by Word is a mobile game that encourages visitors to personalize and share their experience by allowing them to build stories based on the objects that they observe within the museum. The game was primarily designed to support the experience of socializers: visitors to the museum who use the space as an opportunity to share an experience and socialize with one another (Sachatello-Sawyer, et al., 2002). Carried out as the MS thesis project of three students at the IT University of Copenhagen, an iterative, user-centered design approach was used to ideate, prototype and evaluate the game. The game is designed to be played in pairs on a turn-by-turn basis, and participants under the age of 30 were invited to play-test the application at the National Gallery of Denmark in Copenhagen. In assessing how the game actually augments the visitor experience of the museum, the Contextual Model of Learning (Falk and Dierking, 2016) was used as a theoretical frame to evaluate and analyze the findings of our study. The project is motivated by a number of factors: an understanding how digital technologies could be used to enhance the museum experience of visitors and mediate their interpretations of the artwork (Johnson et al., 2015; Tost and Economou, 2006); an interest in increasing the number of visitors to museums and ensuring that the museum experience remains competitive with other leisurely activities (Falk and Dierking, 2016; Johnson et al., 2015; Myrczik, 2014; Wells et al., 2013); and a recognition that visitors should be seen as active participants who can forge their own meanings and interpretations of the artwork, rather than being seen as passive receivers of information (Falk and Dierking, 2016; Wells et al., 2013). 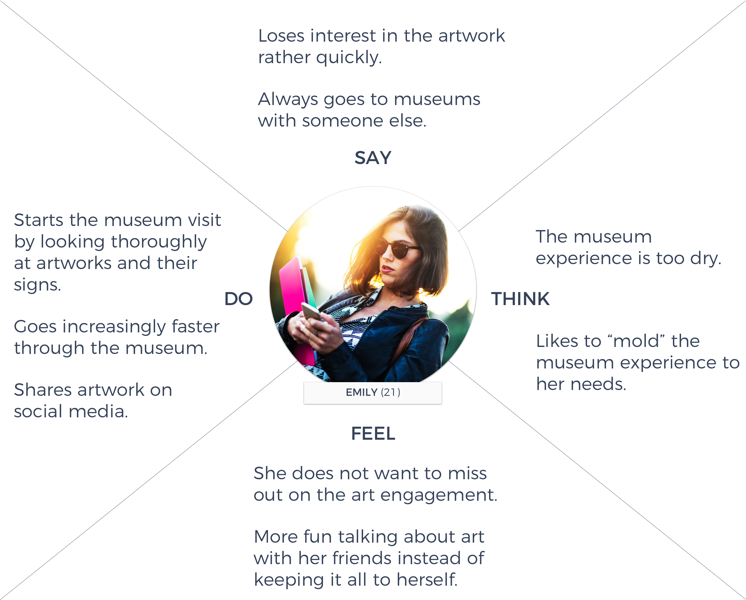 For museums, the project recognizes the increasingly social nature of the visitor experience and their need to engage young visitors to ensure their relevance (Johnson et al., 2015). Discussing collaborative writing in the field of electronic literature, Scott Rettberg notes the importance of constraints and rules for collaborative work—in fact, he claims, “[s]ome collaborative electronic writing projects are essentially nothing but constraints” (Rettberg, 2005). In the fields of theatre and performance art, Agusto Boal’s Theatre of the Oppressed and Allan Kaprow’s “Happenings” demonstrate an uneasy relationship between artistic play and rule-based games, in which artists aim to draw on the playfulness and transgressive qualities of games while avoiding being constrained by strict rules, competition, and quantifiable outcomes. More recently, games like “Tate Trumps” (Tate, 2012), flãneur (Løvlie, 2012) and VanGoYourself (Spild af Tid, Surface Impression, Plurio.net and Culture24, 2015) have explored the potential for using smartphones to unleash visitor creativity through games. The Participatory Museum is a perspective that acknowledges the visitor as the content creator, the distributor, the collaborator and the critic (Simon, 2010). Museums that incorporate this perspective into their digital strategy have often attained encouraging results (see Sanderhoff, 2014): for example, over a two month campaign, the National Gallery of Denmark increased its Instagram reach by 2500% by encouraging visitors to share photos from their personal museum experience (Smith, 2015). Museums have increasingly used play as a means of supporting the participatory museum (Froes and Walker, 2011; Schaller and Flagg, 2013; Shaer et al., 2011; Tate, 2012; Yiannoutsou and Avouris, 2012). In addition to shifting the mindset from “visitor” to “player,” there is a growing recognition that games can also offer the possibility of allowing audiences to actively shape the meaning of the objects, allowing them to be viewed from multiple perspectives (Yiannoutsou and Avouris, 2012): the study reports that although games increase visitor engagement with the artwork, many of them have focused on visitors accumulating factual knowledge about the objects, rather than encouraging them to construct their own meaning. Despite diverse attempts to engage museum visitors—many of them including digital technology—many museums have relied on their authority on how to present the artwork (Samis, 2008). Museums have been reluctant to “break the proverbial fourth wall” (Samis, 2008, 8) and listen to the visitor’s voice. For example, the study reports that in the early 2000s, a professor and his students made headlines in The New York Times for bringing digital recorders to the Museum of Modern Art, recording their own opinions on the artwork, and releasing them online. Museum games raise the potential of encouraging an active visitor voice, and that in order to do so, proposals have been put forward to involve visitors in the design and evaluation process of a game (Yiannoutsou and Avouris, 2012). For this reason, Word by Word follows an iterative, user-centered design approach where museum visitors evaluated and tested the gaming concept at various stages throughout its development. Word by Word is a turn-based game where two or more visitors collaboratively create a story based on their own interpretations of artwork within the museum. It was inspired by a number of existing games—both within and outside of the museum. The core game mechanic of Word by Word is based on an old parlor game called Consequences, where players take turns writing a sentence on a piece of paper. The paper is folded in such a way that each player cannot see the sentence that the previous player has written—resulting in an often bizarre or surreal story. A similar game that inspired Word by Word called Exquisite Corpse encourages players to take turns in drawing various body parts: players cannot see the previous body part was drawn—and the end result is often a surreal figure called an Exquisite Corpse. Word by Word also draws on a number of museum games where visitors observed and interacted with the artworks around them within the museum space. In 2010, Tate Modern offered a game called Tate Trumps (Tate, 2012) where visitors rank different art pieces according to various dimension—they could rank the pieces that they interpreted as being the most menacing, exhilarating, or absurd, or they could determine which piece of artwork would “win” in a battle. The game engendered a strong social dimension where players could interpret the artworks and play against each other. Another game called Scavenger Hunt developed by the Chicago History Museum encouraged children to find objects within the museum space and answer questions about those objects. The game encouraged the players to be aware of their surroundings and actively search for the objects around them. 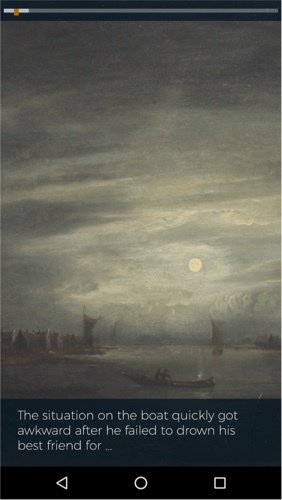 ArteMuse, offered by the Davis Museum, encouraged players to provide their own interpretation of artworks via the use of specific prompts and questions that would lead to deeper insights and perspectives on the work (Shaer et al., 2011). These games made use of collaborative, competitive gameplay; a visitor’s awareness of their surroundings; and prompting to engage visitors with the artworks—features that were incorporated into the design of Word by Word. The game is designed to be played by two or more players, where players collaboratively build a story that features the artworks they see around them in the National Gallery of Denmark. To begin, one of the players selects a theme—either crime, fairy tale, or science fiction—and then the game pairs up the participants and selects a starting player. From that point, a story starter (Figure 1) is shown. The story starter consists of an artwork from the National Gallery of Denmark, along with an incomplete sentence fragment that the starting player needs to finish. The story starter is designed to establish the narrative and tone of the collaborative story that is based on the selected theme. Figure 1: A story starter as presented within Word by Word. The first player is prompted to continue the story, the player photographs an artwork within the museum, finishes the previous sentence that the other player has written, and then starts writing a new sentence. The game switches over to the second player who is tasked with photographing a new artwork and continuing the story in the same way. Players continue to finish each other’s sentences and the game ends once each player completes five turns. The final story consists of 11 images and 11 sentences in total. At the end of the game, users can add a “reaction” to the story and post their story within the story gallery, which can be viewed by other players (Figure 2). The game also offers the option to share the player’s story on social media platforms. Figure 2: Visitors have the option of “reacting” to their story and sharing it within the Story Gallery. The game was developed and evaluated in terms of how it supports the visitor’s interaction and interpretation of the artworks within the museum space using the Contextual Model of Learning (Falk and Dierking, 2016) as a theoretical frame. The sections that follow present the Contextual Model of Learning, the iterative prototyping approach that was used to develop and refine the game—and finally, the results of our user testing within the National Gallery of Denmark and an analysis of how the game supports a visitor experience from the perspective of their personal, sociocultural, and physical context. The Contextual Model of Learning is a model that focuses on why people visit museums, what they do during their visit, and how they create meaning within their visit (Falk and Dierking, 2016). The model frames the complex interplay of the three dimensions of the museum visit: the personal context, the sociocultural context, and the physical context. Gammon and Burch (2008) use the model to create best practice guidelines for designing digital mobile experiences within museums. They argue that a digital technology should fit into the complex nature of social interactions between museum visitors, correspond to their personal interests, and fit into the museum space. The personal context accounts for the visitor’s degree of experience and knowledge before they enter the museum. The personal context also accounts for visitor preferences: their preferred approach to learning and engaging, along with individual interests, attitudes, motivations and behaviors. In accounting for the personal context, digital interventions raise the potential to positively influence the museum experience by offering the ability to provide a level of customization and personalization (Falk and Dierking, 2016; Froes and Walker, 2011; Gammon and Burch, 2008). According to Gammon and Burch (2008), many museum technology projects have failed due to the fact that the target audience of these projects was too wide—their findings suggest that such projects should cater to the personal needs of the visitors and target a more specific audience. The sociocultural context accounts for the social aspect of the museum visit and is gaining increasing recognition in its role in shaping the overall experience. The research argues that museum visitors are strongly influenced by social interactions and conversations (Falk and Dierking, 2016; Pekarik et al., 1999; Tost and Economou, 2006): for example, from the years 2009 to 2011, 93% of museum visitors in Denmark have reported visiting the museum with a companion (Jensen and Lundgaard, 2015). In accounting for both the personal context and the sociocultural context, adult museum visitors can be classified into four groups (Sachatello-Sawyer et al., 2002): knowledge seekers who have a strong desire to learn; skill builders who are looking to learn or improve a specific skill; museum lovers who are passionate and serious about the museum experience; and socializers who use the museum to spend time with other people. In light of the sociocultural context, Gammon and Burch (2008) state that the design of any digital technology or intervention should allow existing social interactions to continue, and that well-designed museum mobile applications can actually support rather than disrupt social interactions within the museum space. The physical context accounts for the actual museum environment, referring to its conditions—such as lighting and temperature—along with its objects and infrastructure (Falk and Dierking, 2008; Falk and Dierking, 2016). Digital technologies should account for how visitors move, observe, and interact with one another within the actual museum space and should augment or compliment—rather than distract from—the physical space. To account for the visitor’s physical context, we employed observation techniques used in Design Thinking (Brown and Jocelyn, 2010) to better understand how users interact within the physical space of the museum. Activities—What are the users doing? Environments—What and how are they using the space around them? Interactions—How are they interacting with the space, the objects, and the people around them? Objects—What objects do the visitors see, touch, feel, or interact with? Users—Who are the visitors? What are they doing? What are their intentions and motivations? Since all user testing took place within the National Gallery, we observed the physical space and its surroundings. The National Gallery of Denmark is the largest museum in Denmark and has two floors (Statens Museum for Kunst, n.d.). During the observation period, there was a temporary exhibition on the ground floor of the museum that featured Japanese art called Japanomania. The second floor featured permanent collections that contained pre-20th century European, French, Danish, and Nordic paintings. There were a number of interactive digital displays that featured additional text and information from the perspectives of art historians, artists, and conservators. Museum visitors were observed during their visit at the Japanomania exhibition. Visitors generally observed the artwork in chronological order, starting with the artwork that was closest to the entrance, then moving their way into the exhibition. As visitors progressed throughout the exhibition, they spent less and less time viewing the artwork. Our study targeted museum visitors between the ages of 14 and 29. Although 14 to 29-year-olds are seen as the age group who visit the museum the least (Jensen and Lundgaard, 2015), their engagement is critical to the continued relevance of museums (Johnson et al., 2015). In addition, a decision was made to focus specifically on how Word by Word could be used to support the social museum experience, given that the majority of people visit the museum with a companion (Jensen and Lundgaard, 2015). In order to support a rapid and agile process, we followed the “lasso toss” methodology described by Hedemann (2010) and constructed a provisionary persona on the basis of an interview with two museum visitors that matched our target group, the Socializers (Sachatello-Sawyer et al., 2002). Our two interviewees were female friends in their early 20s who enjoyed visiting museums with friends and were comfortable in using their mobile phones during the visit. One of the participants stated that if an artwork reminded her of someone, she would sometimes use her phone to take a picture of the artwork and send it to her friend. Figure 3 shows an empathy map of the persona that motivated the design of Word by Word, constructed on the basis of these interviews, our observations at the museum, and the pre-existing literature. Word by Word was developed using an iterative prototyping model that focus on three main areas: implementation, look and feel, and role (Houde and Hill, 1997). An implementation prototype examines how the product may work in its operational environment, and may also be used to examine the technical feasibility of the project. A look and feel prototype focuses on its visual and interaction design, whereas a role prototype focuses on the meaning created by using the product. The first two prototypes examined the technical feasibility of Word by Word as tested within the museum, and also demonstrated an initial first proof-of-concept of its gameplay. The second two prototypes focused on refining and improving the game’s user experience, ensuring that usability problems were addressed; that the mood, tone and language of the game were appropriate for visitors; and that visitors could actually use the game to build a coherent story. The final two prototypes focused on refining the user experience further, with more focus on understanding how or if the gameplay experience could support the visitor experience of the museum and their interpretation of the artworks. Figure 4: Word by Word was developed iteratively to assess the games technical feasibility, user experience, and the way it augments their experience of the museum and its artworks. The first two implementation prototypes demonstrated the initial first proof-of-concept where users were presented with a screenshot of an artwork with a starting sentence that they need to finish. The goal of the first two prototypes was to determine if the game was feasible, and to see if users could test the core game mechanic in its intended environment in a performant and bug-free manner. A decision was made to develop the game as a React Native application, which allows the game to be written in a Web-based framework that can be deployed across both Android and iOS platforms. At this stage of the prototype, players can—on a turn-by-turn basis—complete the sentence and start the next one by taking a photograph with the phone’s camera. The technical feasibility of the concept was tested, such as how the game responded on working smartphone hardware; how the phone’s camera could be used in a way that did not drain the phone’s battery; and how the game responded under the cellular and network conditions that were provided by the National Gallery’s Wi-Fi. The second set of prototypes focused on developing and improving the game’s user experience. 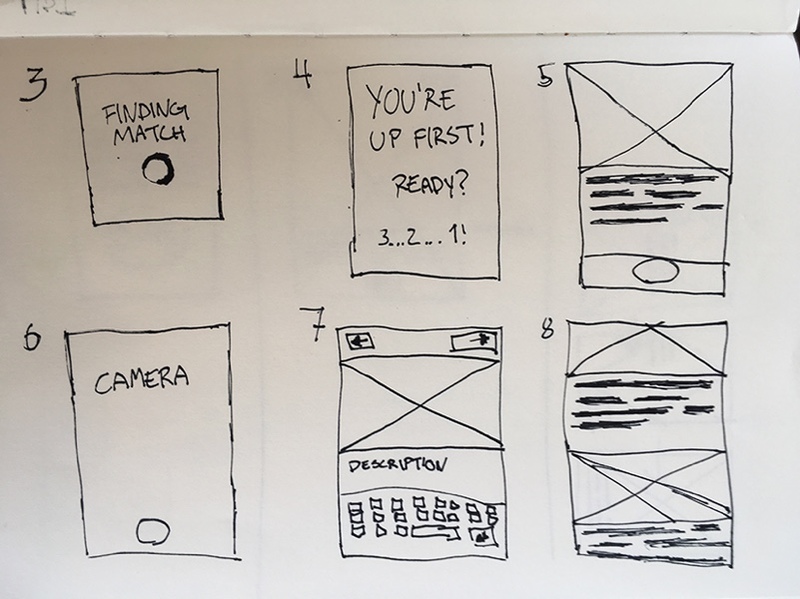 These initial prototypes were in the form of paper wireframes (Figure 3) that show a design heavily inspired by Instagram and Snapchat. A decision was made to adopt the design and conventions of these apps into Word by Word so that users would be familiar with them. These conventions—such as the use of full-screen imagery for the artworks accompanied by transparent text overlays for their captions—were intended to focus the user’s attention on the artwork and their captions, while providing a sense of familiarity based on conventions established by popular social media applications. The design of Word by Word was initially implemented as paper, and then clickable prototypes, and then finally implemented as a working version of the application. Figure 5: The initial paper wireframes of Word by Word. The results of user testing from the first set of implementation prototypes also provided important feedback on the core game mechanic: the ability to build stories by finishing each other’s sentences. Users in the first round of testing initially reported that they didn’t understand what the game was about or what they needed to say, and some simply used the game as a chatting application to talk amongst their friends. A number of design features were implemented to ensure that players were encouraged to build a coherent story; namely that the prompting of the game was changed so that each screen displays the last sentence that the previous player wrote that could lead the current player to write the next sentence, along with the ability for players to choose a theme. Further revisions also added a series of tutorial screens so that players could orient and familiarize themselves with the basic mechanics of the game before they started playing. During testing, a number of users stated that they felt they “weren’t being creative enough,” or that the game was “not funny enough.” Users also reported that the theme or type of artwork made the story creation process either easy or difficult—for example, it was easier to create humorous stories in parts of the museum that prominently featured people than it was in sections that contained only landscape or abstract paintings. To address this issue, the language and tone of the game was adjusted to be light and humorous, and “story starters” (see Figure 1) were created for various themes that also incorporated abstract and landscape works. The final set of prototypes focused on further refining the game’s design and how it supports the visitor’s role and motivations. At this stage, the focus of development was shifted from assessing the game’s technical feasibility and interaction design to assessing how it actually supports the visitors personal, sociocultural and physical context within the museum. The interviews conducted with users during these final iterations were designed to uncover insights about the visitor’s engagement with the game and how it augments (or detracts) from the museum experience. If I would have already been at the museum once, and I would be going to refresh my memory of the art, I would probably play it because I would not be there for the first time trying to appreciate all the art. Because then [during the first museum visit], I think it is a bit distracting having to think of a story, because I want to see the art for the first time and have responses to it. But I think many people go to galleries second time and third time because of the new art. I think then it would be fun, because then you can appreciate the art from a new perspective because you have a different mission. So I think then it would be nice. “Maybe if we would have been here the whole day and knowing [sic] all the pictures and knowing what they were about, maybe it would be easier to connect the pictures [when playing the game]. Others stated that, although the game might be useful as a learning tool for school exhibitions, it may not suit those who already have a prior motivation and intention of visiting the museum. […] So maybe if you have an exhibition for school classes, it […] would be really nice because they probably don’t know what to do. But I know what I want and I don’t want to be disturbed. I think it was pretty funny that you get to look at some paintings that you would maybe ignore otherwise because you are looking for some stuff to fit your story. If it is pictures of a lot of landscapes and stuff, then it is not fun [to play]. […] We came for the [Japanese] exhibition because we have both been in Japan. I think the game would have been more fun if we would have played it there. The paintings here were a bit boring. In accounting for the game’s physical context, the relevance of the themes as presented within the game to their surrounding artworks, the location of the player within the museum, and the way they moved within the space, a;; accounted for important factors that affected their level of engagement with the game. Word by Word is a social, story-building game that utilizes the physical space—along with digital assets—to augment the social experience of the museum visit. The game is primarily designed for Socializers (Sachatello-Sawyer et al., 2002). Although the game’s humorous tone and simple gameplay supported social interaction within the museum space, some participants reported that the game either lacked depth or did not satisfy their curiosity and knowledge requirements for the artworks. Our study supports ongoing work within the literature of the need to narrowly define and target audience segments when designing digital interventions within museum spaces (Gammon and Burch, 2008), along with the need to consider the museum visit as a complex, multi-faceted experience that incorporates a range of dimensions. Using the Contextual Model of Learning as a theoretical frame, our study demonstrates how a digital intervention could be iteratively prototyped in a way that considers all testable dimensions of the product along with an assessment of how that product could be used to support the personal, sociocultural, and physical contexts of the museum space. This project has received funding from the European Union’s Horizon 2020 research and innovation program under grant agreement No 727040 (the GIFT project). We would like to thank Bogdan Spanjevic and NextGame for contributing to the original idea for the Word by Word game, and giving valuable input in the process. Adams, M. (2009). “Mixed Reality Arts.” In M. Montola, J. Stenros, & A. Waern (Eds. ), Pervasive Games: Theory and Design, 236-40. Burlington, MA: Morgan Kaufmann Publishers. Blomberg, J., J. Giacomi, A. Mosher, & P. Swenton-Wall. (1993). “Ethnographic field methods and their relation to design.” In Participatory Design: Principles and Practices, 130–35. CRC Press. Boal, A. (2002). Games for Actors and Non-Actors. 2nd. Trans. Adrian Jackson. New York: Routledge. Brown, T. & W. Jocelyn. (2010). “Design thinking for social innovation.” Development Outreach, 12(1), 29–43. Elster, J. (2000). Ulysses Unbound: Studies in Rationality, Precommitment, and Constraints. Cambridge, UK: Cambridge University Press. Falk, J. H. & L.D. Dierking. (2008). “Enhancing visitor interaction and learning with mobile technologies.” In L. Tallon & K. Walker (Eds. ), Digital Technologies and the Museum Experience: Handheld Guides and Other Media. Lanham: AltaMira Press. Falk, J. H. & L.D. Dierking. (2016). The museum experience revisited (1st Edition). London: Routledge. Froes, I. C. G. & K. Walker. (2011). “Art of Play: Exploring the roles of technology and social play in museums.” In K. Beale (Ed. ), Museums at Play: Games, Interaction and Learning, 486-99. Edinburgh, Scotland: MuseumsEtc. Gammon, B. & A. Burch. (2008). “Designing mobile digital experiences.” In L. Tallon & K. Walker (Eds. ), Digital Technologies and the Museum Experience: Handheld Guides and Other Media. Lanham: AltaMira Press. Hedemann, O. (2010). Idéutvikling i mediehuset. IJ-forlaget. Houde, S. & C. Hill. (1997). “What do prototypes prototype?” In Handbook of Human-Computer Interaction, 367–81. Jensen, J. T. & I.B. Lundgaard. (2015). Museums—Citizens and sustainable solutions. Copenhagen: Danish Agency for Culture. Johnson, L., S. Adams Becker, V. Estrada, & A. Freeman. (2015). The NMC Horizon Report: 2015 Museum Edition. Austin. Myrczik, E. P. (2014). “Satisfying personal needs at the museum: The role of digital technologies.” MedieKultur: Journal of Media and Communication Research, 30 (57), 176-96. Pekarik, A. J., Z.D. Doering, & D.A. Karns. (1999). “Exploring satisfying experiences in museums.” Curator: The Museum Journal, 42(2), 152-73. Rettberg, S. (2005). “All Together Now: Collective Knowledge, Collective Narratives, and Architectures of Participation.” In Digital Arts and Culture Conference. Sachatello-Sawyer, B., R.A. Fellenz, H. Burton, L. Gittings-Carlson, & J. Lewis-Mahony. (2002). Adult museum programs: Designing meaningful experiences (AltaMira P). Walnut Creek. Samis, P. (2008). “The exploded museum.” In L. Tallon & K. Walker (Eds.) Digital Technologies and the Museum Experience: Handheld Guides and Other Media. Lanham: AltaMira Press. Sanderhoff, M. (Ed.). (2014). Sharing is Caring: Openness and sharing in the cultural heritage sector. National Gallery of Denmark. Tost, L. P. & M. Economou (2006). “Evaluating the social context of ICT applications in museum exhibitions.” In Proceedings of the 7th International Conference on Virtual Reality, Archaeology and Intelligent Cultural Heritage, 219-28. Aire-la-Ville: Eurographics Association. Wasson, C. (2000). Ethnography in the field of design. Human Organization, 59(4), 377-88. Wells, M., B.H. Butler & J. Koke. (2013). Interpretive Planning for Museums: Integrating Visitor Perspectives in Decision Making. Walnut Creek: Left Coast Press. Yiannoutsou, N. & N. Avouris. (2012). Mobile games in museums: from learning through game play to learning through game design. In ICOM Education, 79-86. Wray, Timothy, Ingimundardottir, Elin, Stanciauskaite, Greta, Wray, Timothy and Løvlie, Anders Sundnes. 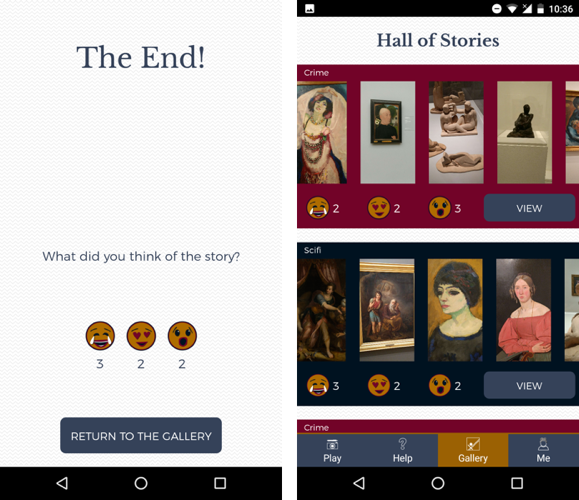 "Word by Word: A mobile game to encourage collaborative storytelling within the museum." MW18: MW 2018. Published February 16, 2018. Consulted .